We, Raj International Exports, are amongst the leading manufacturers, exporters and suppliers of supreme quality range of Sports Goods & Balls, since our inception in the year 2003. Making of this range is done as per the set industry norms and guidelines, utilizing the finest raw materials and modern machines. This ensures the product’s strength, finishing and durability. Also we export our product All over the world. The offered range comprises the finest Soccer Balls, Rugby Balls and Boxing Gloves, which are widely acclaimed and asked for. In addition to this, the offered range is marked at the most reasonable rate possible. The state-of-the-art infrastructure at Raj International Exports, undergoes regular up-gradation, for reasons of attaining a better position in the market. The facility has been laced with all the necessary machinery and equipment, which are needed for the attainment of several of the firm’s predefined goals and objectives. For better and effective management of the firm’s operations, the facility has been parted into a number of units, highly operational in nature. Further, these units, helps us maximize productivity. In addition to this, our highly ethical work practices, have helped us generate a highly reputed client base. Under the able management of Mr. Rajiv Kumar, we have managed to attain greater heights of success, in the past years of our existence. His ability to foresee market changes and make commendable decisions, have helped us smoothen our path to glory. 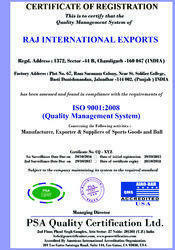 Manufacturing, Trading, Importer and Exporter of Sports Goods and Balls. Our team of highly skilled and experienced professionals, are recruited on the basis of their ability to work and willingness to perform. The professionals, in the most dedicated and efficient manner, help us in the attainment of several of the firm’s predefined goals and objectives. To manage the operations of these professionals, in the best possible manner, we have sorted the professionals into a number of highly operational units. Further, these professionals are regularly trained, for reasons of keeping them updated. To us, quality is something of high importance. Thus we engage in the utilization of high grade raw materials and modern machines, in compliance with the set industry norms and guidelines. This ensures the product’s strength, finishing and durability. In order to provide a highly standardized range of products to our clients, we process the range through a number of quality examinations, where all manufacturing defects are eliminated with high level of precision. The highly advanced state-of-the-art infrastructural facility, has been equipped with all the necessary machinery and equipment, which helps us in the attainment of several of the firm’s predefined goals, targets and objectives. For reasons of attaining better management of the firm’s operations, the facility has been parted into a number of highly operational units. Further, regular up-gradation of the facility, has helped us in the maximization of our reach in the market and boost our capacity to produce. We are considered in the market to be one of the leading manufacturers, exporters and suppliers of supreme quality range of Sports Goods & Balls. For the purpose of standing up to this reputation, we engage in the utilization of high grade raw materials and modern machines, in accordance with the set industry norms and guidelines. This ensures the product’s durability, strength and finishing. Further, the offered range is known to be marked at the most reasonable rate possible and is delivered in the timeliest manner. 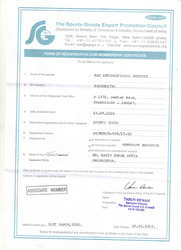 Member the sports goods export promotion council.